This is a copy of the venerable GretagMacbeth ColorChecker®. 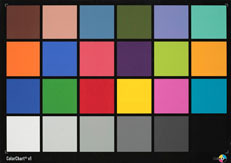 The ColorChart® v1 is manufactured by Calibr8 (www.argraph.com/catalog/calibr8.htm). The sample tested was 30 x 21 cm in size (about 8.25 x 11.75 inches), consisting of a foam board with the color on one surface. 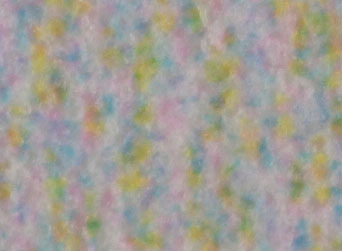 As shown in the following image of the Neutral 8 patch, it is clear that the ColorChart® v1 is an inkjet print mounted on the foam board. The ColorChart® has a printed black frame, so the surface is uniformly flat. It has a matte surface, which may have been spray applied. The white paper used for the print contains a fluorescent whitening agent. The grays are not spectrally neutral, with a defined peak at 500-510 nm. This peak appears in almost all the patches. There is also increased red reflectance. The print was produced on a printer with at least 6 colorants. The reference CIE 1976 L*a*b* coordinates were obtained by averaging spectral measurements from two October 2002 edition ColorCheckers®. The charts were measured with a GretagMacbeth Spectrolino® equipped with a D65 filter. The spectral data was acquired, averaged and analyzed with SpectraShop™. In the following Spectra graphs, the blue line is the ColorChart, the brown line is the reference ColorChecker.